Our backyard orchard is filled with stunning pink and white blossoms, buzzing busy bees, and tiny fruit growing on our field of fruit trees. 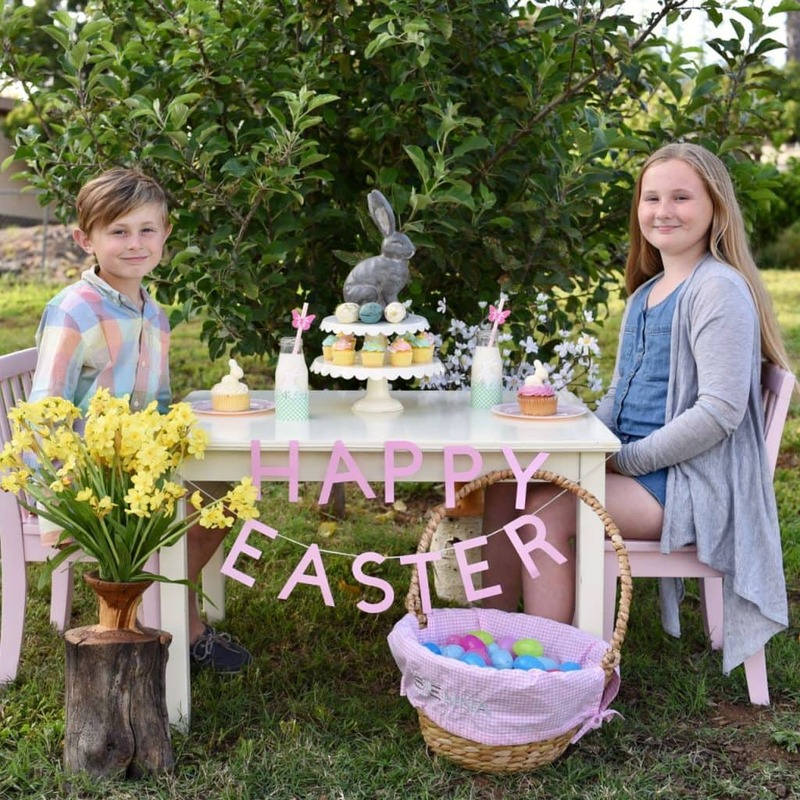 I wanted to head outside and enjoy nature’s beauty with my kids, so I set up a pretty Easter table outside in the yard. 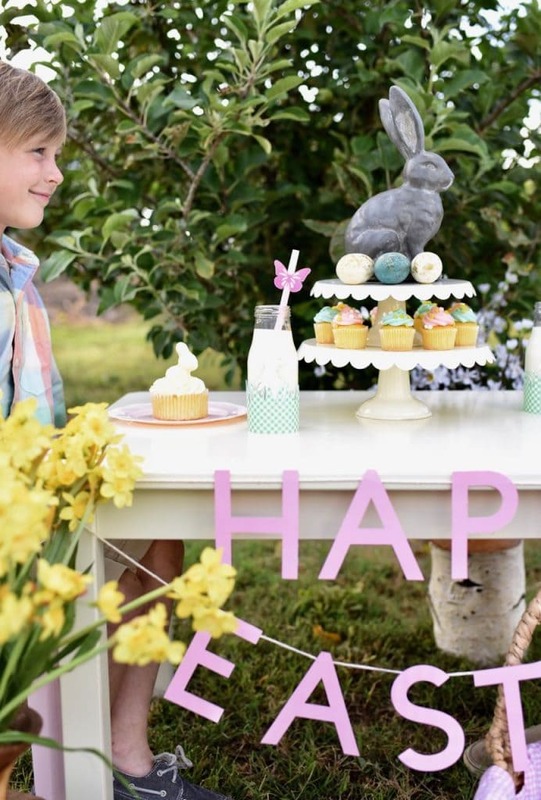 Today I’m sharing how to create Easter table decor with Martha Stewart and Cricut, two of my absolute favorites! 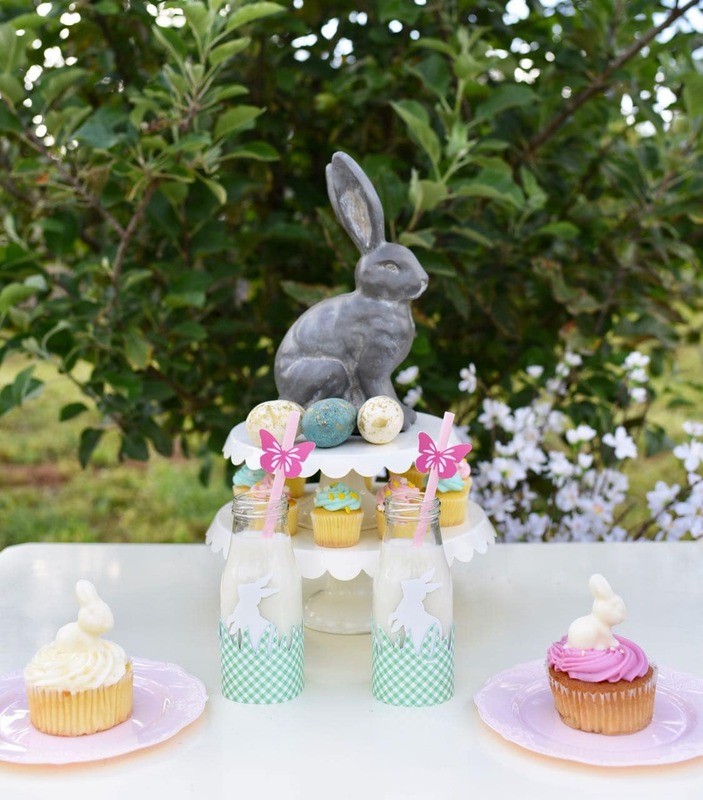 I wanted to create a light, bright, pretty Easter table for my kids in pink, white, and green. 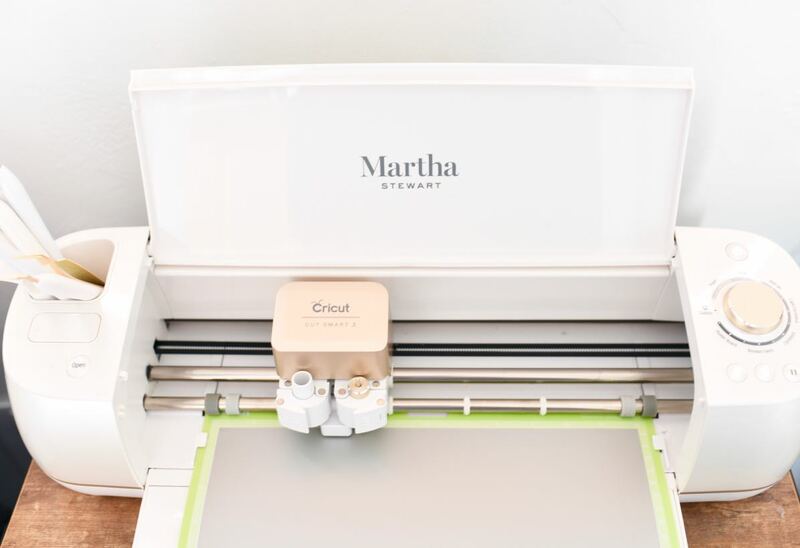 Anytime I plan a party (multiple times each month), I always start with my Cricut Explore Air 2, Martha Stewart Special Edition machine. 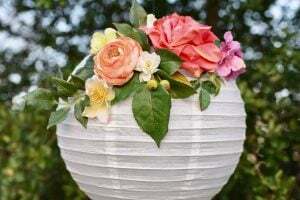 It’s such an easy way to create custom party decor for any theme, in any colors, anytime. 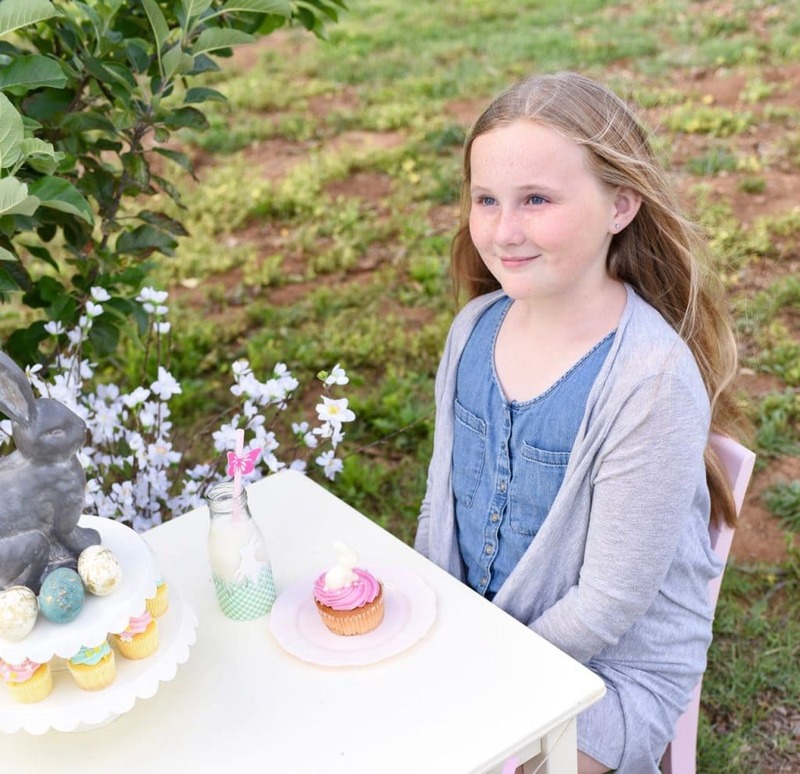 I came up with a couple of Cricut Easter projects that made our Easter for kids fun and inviting! 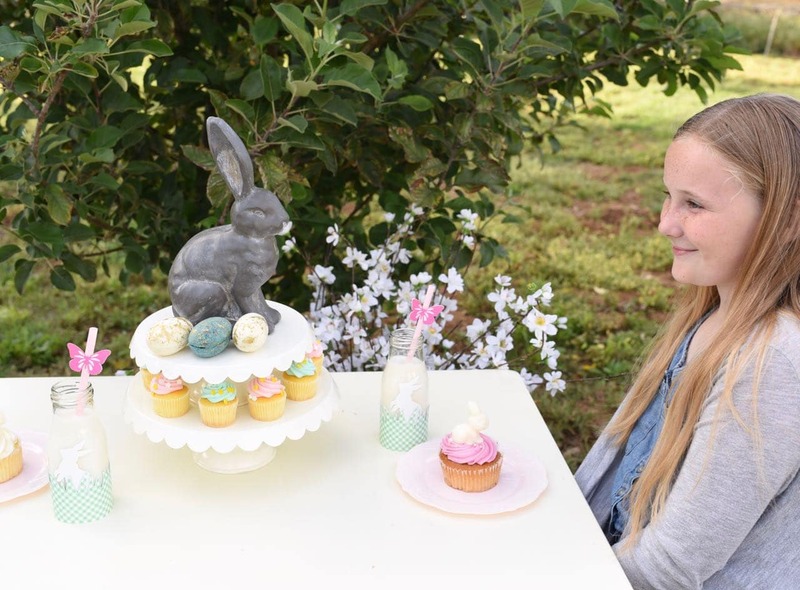 First I’ll share the party with you, and then show you how easy it was to make some of the Easter table decor and share the cut files with you so you can make your own. 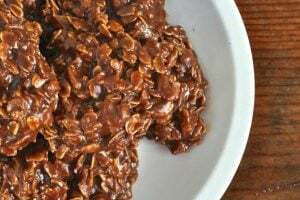 Let’s start with my kids’ favorite part- the treats! 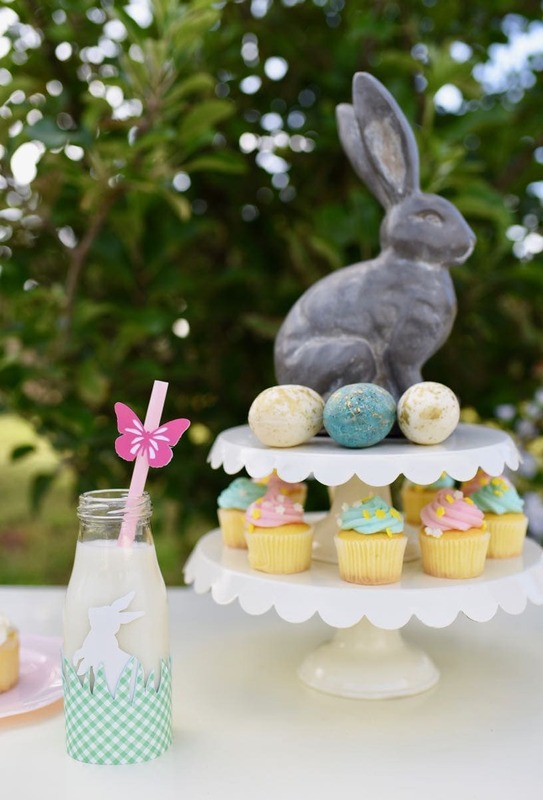 These Easter treats for kids were simple, yet fun for their Easter table. I stacked two scallop cake plates I had on top of each other, then added my Easter bunny decoration to the top. Around the bunny are some pretty blue and white with gold chocolate Easter eggs I made. They are solid chocolate and are so pretty with edible gold luster dust splattered on them! 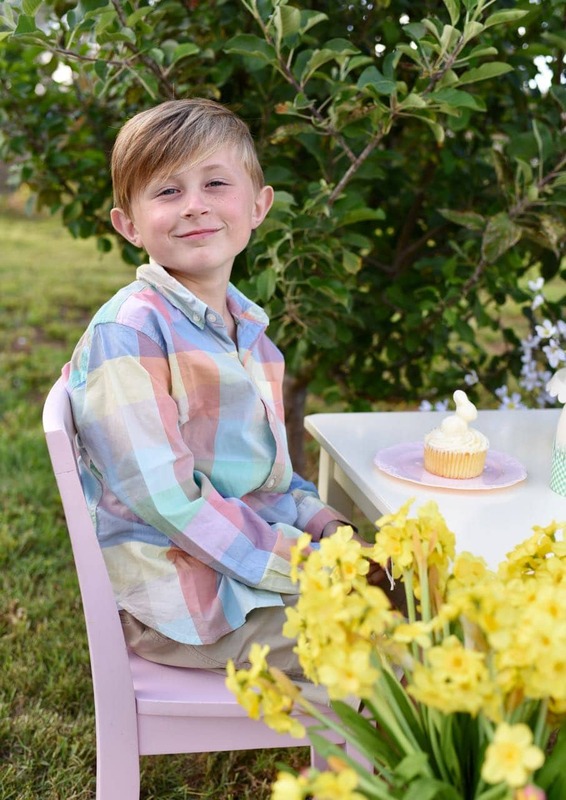 The second tier is filled with mini pink and green vanilla cupcakes with sprinkles that match the party perfectly. 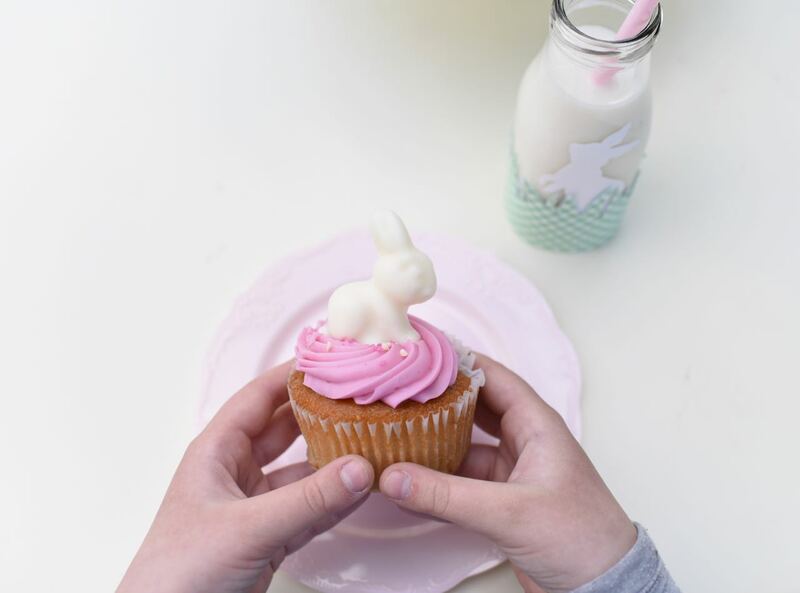 Pink plates each hold a large lemon and strawberry cupcake topped with a white chocolate bunny cupcake topper that I made from Easter chocolate molds. I inherited lots of sucker and lollipop molds from my grandmother, who would delight us children with homemade hard suckers and chocolate lollipops every time she visited. Love them so much! 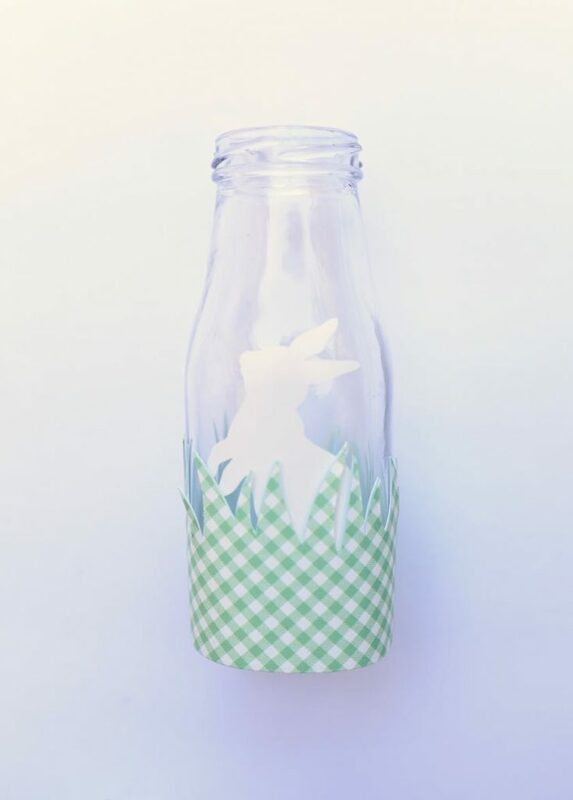 You just can’t have cupcakes without an ice cold glass of milk, so I decorated some milk glass bottles with plaid green grass, white vinyl bunnies, and pink and white butterfly straws, all made with my Cricut machine! Keep reading for the how-to’s at the end of the post. 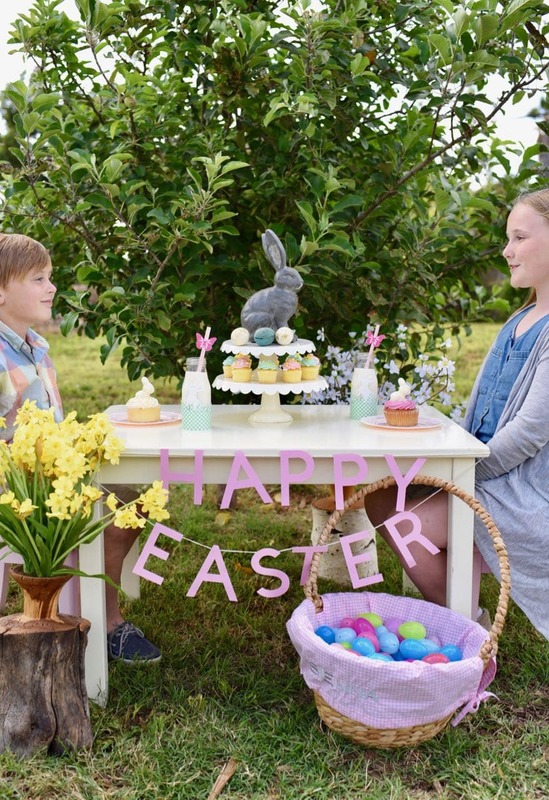 Bright yellow daffodils and white blossoms add to the spring feel of the Easter table. My husband’s uncle is a wood turner and turned these gorgeous rustic wood twig pots for us. They look so pretty with spring flowers tucked inside them! My baby girl’s Easter basket is filled with plastic eggs and lined with a pink and white gingham liner embroidered with her name. 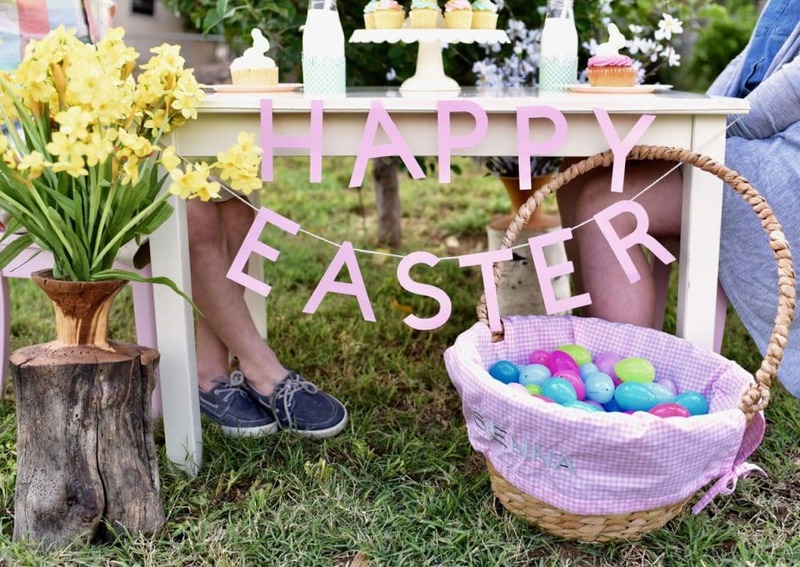 At the front of the table hangs a “Happy Easter” garland that I cut with my Cricut Martha machine. I love making my Cricut machine do all the work for me! 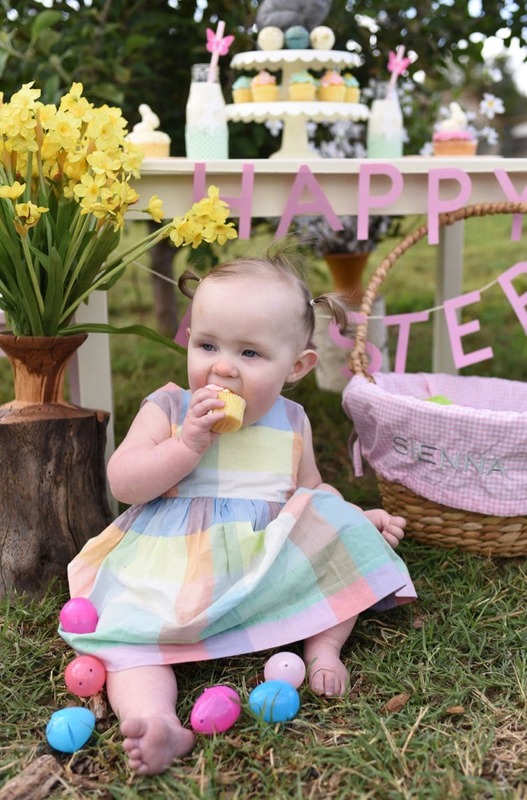 If you want to make your own Easter garland,you can find the cut file here. I hope you enjoyed these Easter table ideas. My kiddos adored our Easter table decor and pretty Easter table as much as I did, which made every second of planning, creating, and making worth it! 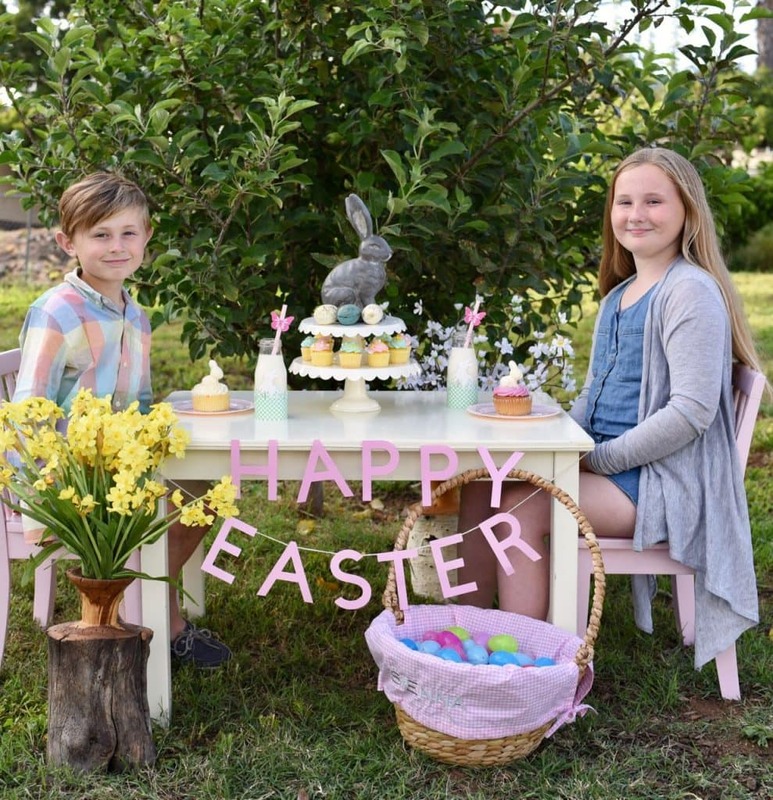 They’re already planning out a pre-Easter egg hunt that they came up with, where each one is buying candy for the other one with their own hard-earned money, then filling and hiding the eggs for each other. Love their kind hearts. Even my sweet baby girl got in the fun, with her plaid Easter dress matching her big brother’s Easter shirt. I think it’s safe to say that she liked it, ha! 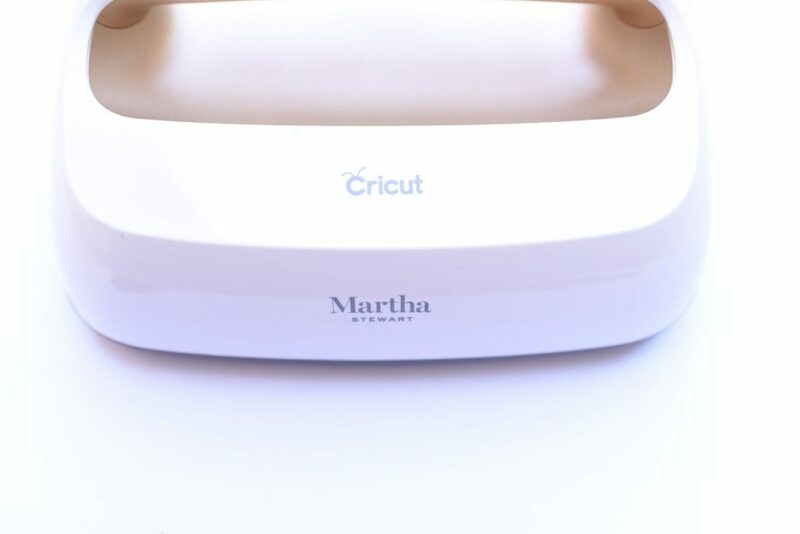 To make all my projects I used my Cricut Explore Air 2, Martha Stewart Special Edition machine that is sold exclusively at Michaels. It’s got the beautiful look and style you expect from Martha Stewart with it’s vanilla pearl color and pretty gold accents. It also cuts so precisely and perfectly, just like you expect from Cricut. It’s the perfect cutting machine that can cut all sorts of things- paper, vinyl, iron-on, glitter paper, cork, and 95 other materials! 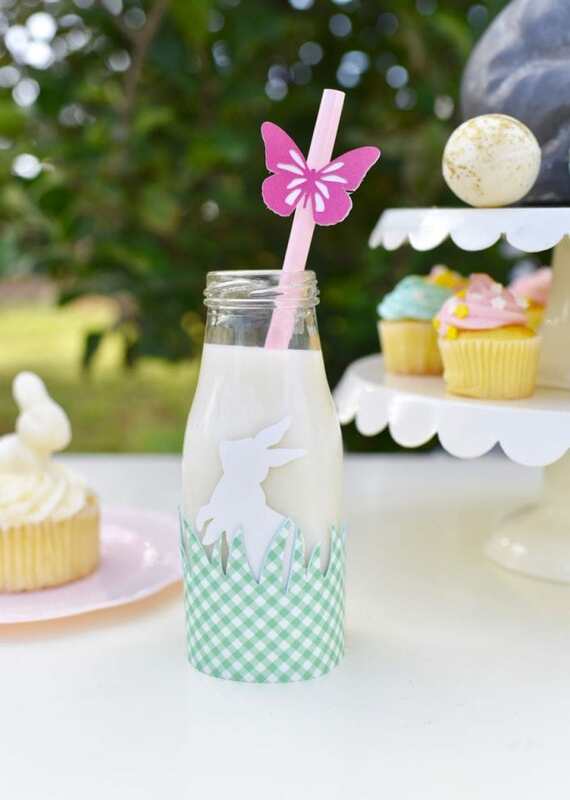 Pretty pink and white butterflies on the straws were such a lovely addition to our Easter table decor, and couldn’t be much easier to make. 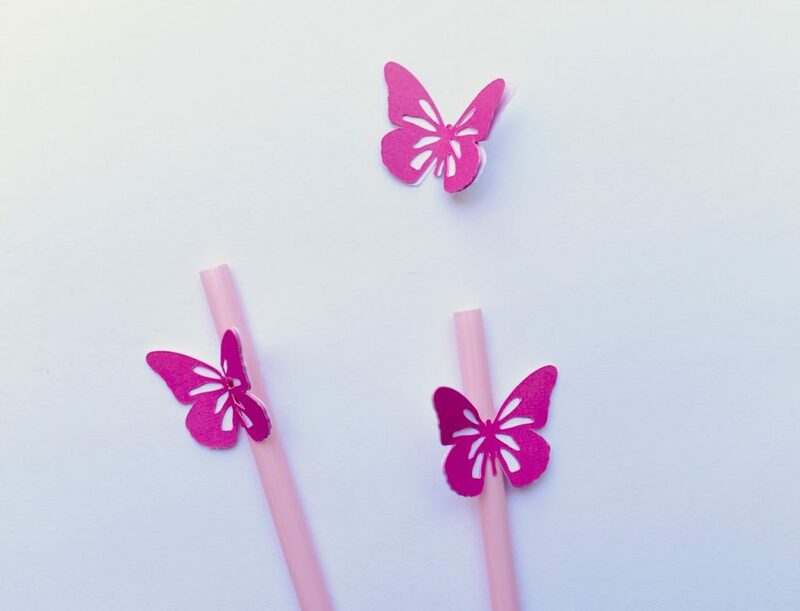 I was inspired by these darling butterfly drink stirrers, and customized them in our Easter party colors to go with our straws. To make your own, head over to the cut file in Design Space. You’ll also see the design I created on the glass milk bottles. To cut just the butterflies, click on the eye to the right of the grass border and the bunny to hide them. Click the green “Make It” button, and follow the prompts to load your mat and cut your butterflies. Adjust the number for how many butterflies you would like to make. 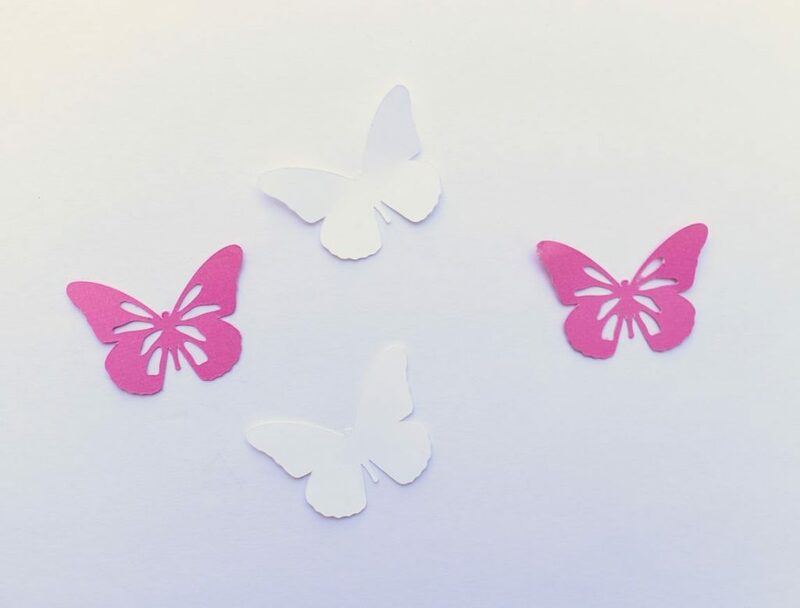 Once the butterflies are cut, remove them from the mat and glue the middle back of the pink butterfly to the white butterfly. Bend slightly in the middle, so it looks like the wings are fluttering, and use a bit of glue to add the butterfly to the top of each straw. A low temp glue gun worked perfectly for this. 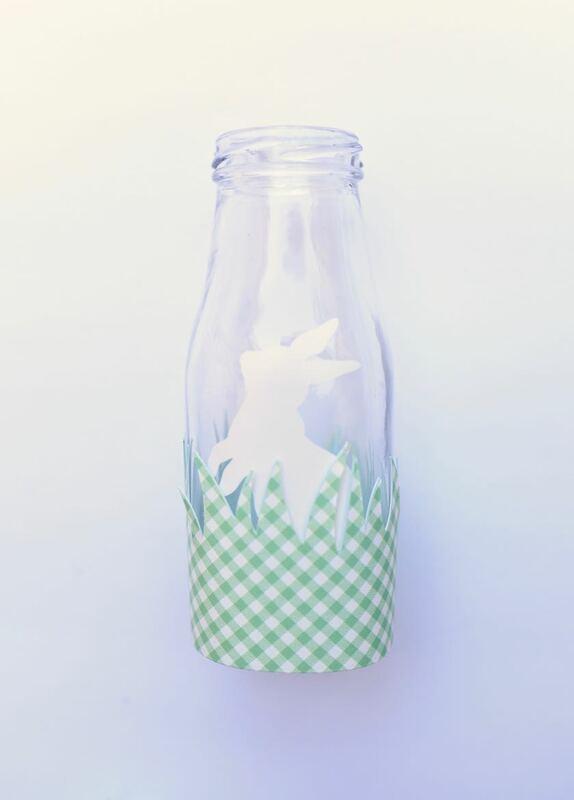 To customize the drinks even more, I created a cute Easter bunny scene on each glass bottle with a white bunny in green and white plaid grass. Go to the cut file in Design Space. 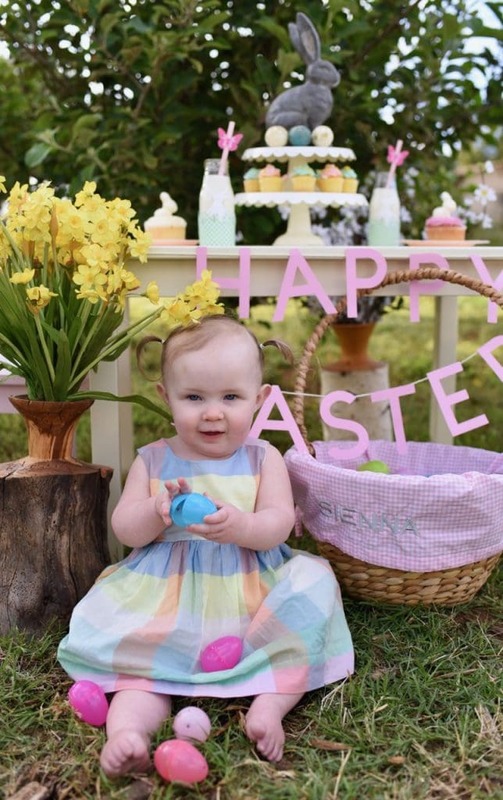 To cut just the Easter bunny and grass, click on the eye next to the pink and white butterflies to hide them. 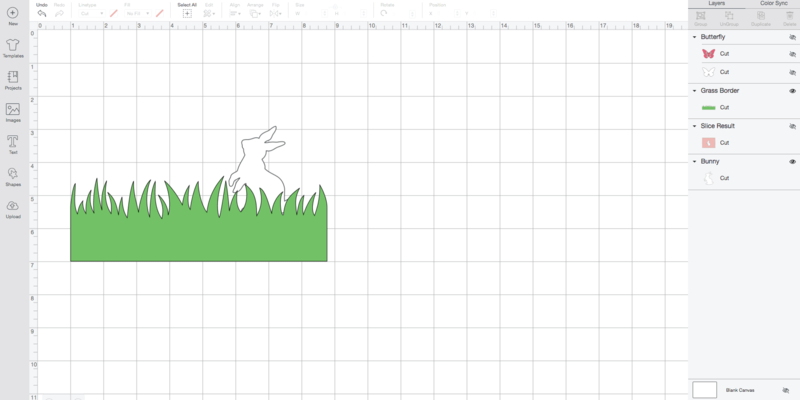 Click the green “Make It” button, and follow the prompts to load your mat and cut the grass and bunny. Adjust the number for how many sets you would like to make. You will need to cut the bunny on the white vinyl, and the grass on the green card stock AND the green plaid iron on. Once the designs are all cut, remove them from the mat. 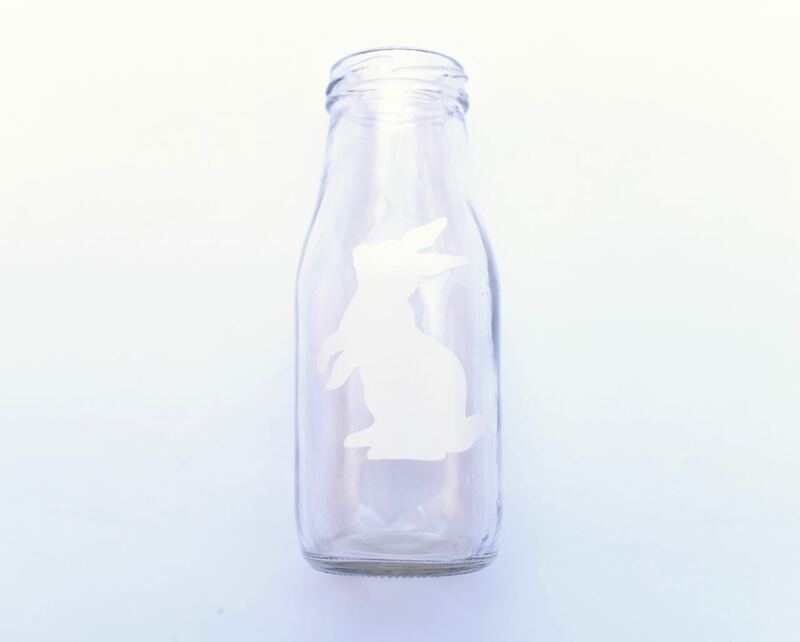 Remove all the excess vinyl from around the bunnies, then peel and stick one bunny onto each glass bottle. 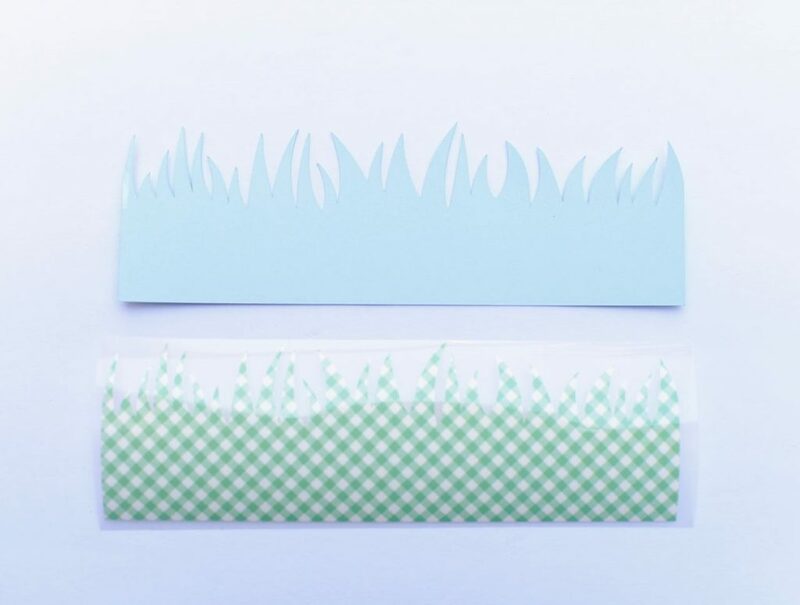 For the grass, you will be using the Cricut EasyPress 2 (or an iron) to adhere the plaid iron on grass to the card stock grass. Heat up the EasyPress (or iron) according to the temperatures found in the EasyPress Intereactive Quick Reference Guide. Preheat the card stock with the EasyPress, then line up the plaid grass so it is directly lined up with the card stock. Place the EasyPress over both grass cut outs, then leave on for the correct amount of time. Remove the EasyPress, then repeat for the appropriate time on the back of the design. 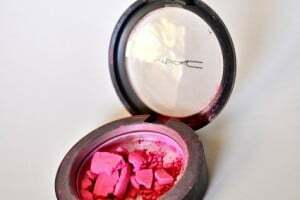 Let cool, then peel off the plastic sheet. Wrap the grass around the base of each bottle, and use clear tape to hold it in place. 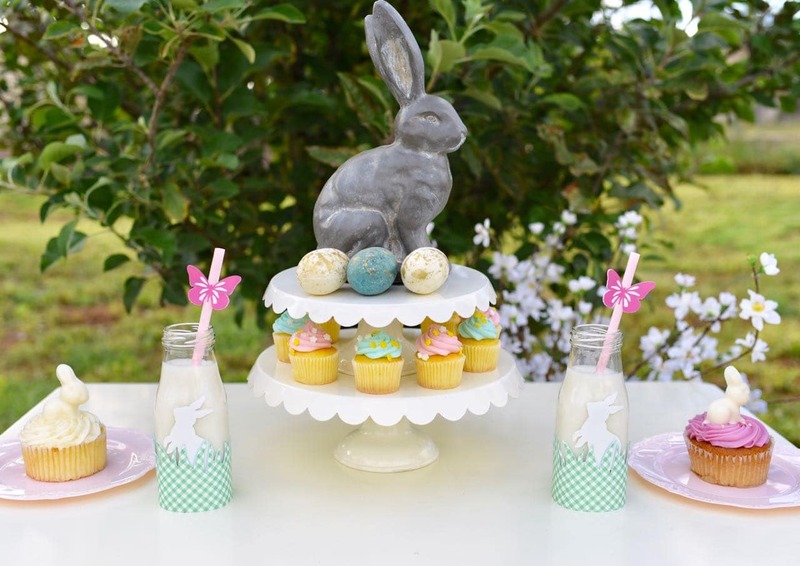 Aren’t these Easter bottles cute?!? Definitely an upgrade from the plain version. 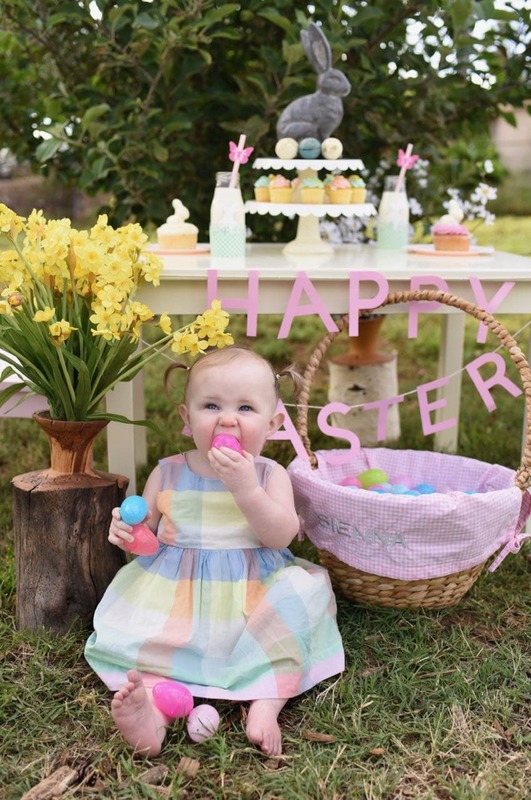 Thanks for letting me share our Easter table decor and Easter crafts with you!